The process doesn't have officials even counting wrongly-rejected absentees until just two days before the new members of Congress are sworn in. 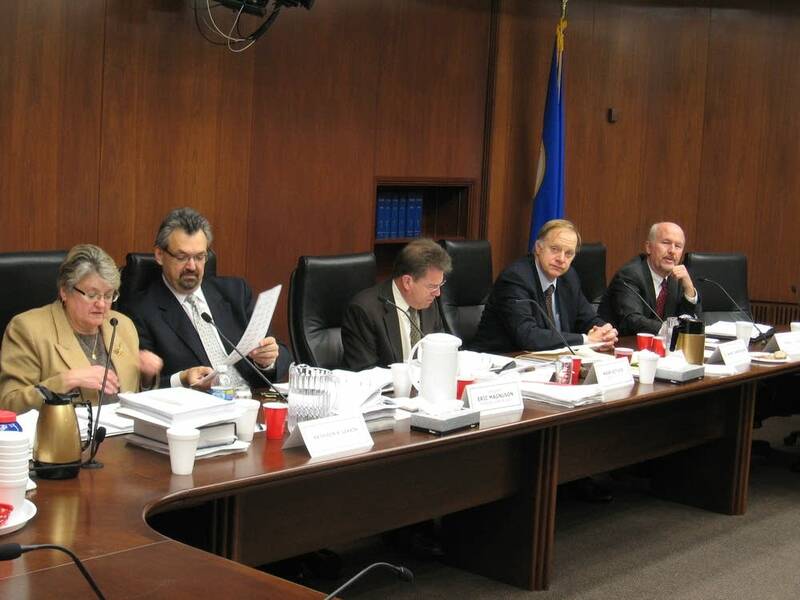 The State Canvassing Board also met this morning and came a step closer to wrapping up its work on ballot challenges. Secretary of State Mark Ritchie told reporters about the absentee ballot plan following the brief morning meeting of the canvassing board. All of the parties are under Minnesota Supreme Court order to come up with a way to identify and count an estimated 1,500 to 1,600 wrongly-rejected absentee ballots. The plan they've submitted for the high court's review would count rejected absentees only if both sides agree they were wrongly cast aside. Under the process, counties would be required to submit unopened wrongly-rejected absentee ballots to Ritchie's office by Jan. 2. The Secretary of State's office would then open and count the ballots by Jan. 4. Finally, both campaigns would have an opportunity to challenge ballot decisions before the State Canvassing Board. The proposal draws out the process past the high court's end-of-the-year deadline. It could leave Minnesota without a decision on who won the race until after the new class of Senators is sworn in on Jan. 6. Ritchie said concluding the work in time for the new session of Congress is not something he's at all concerned about. "We've been really clear in saying our top priority is accuracy and transparency and the timing thing is just not our issue," Ritchie said. "I want to put an underline, we don't care as long as it's accurate and we've done it in an accurate and transparent way. We don't care when it's done." Senate Majority Leader Harry Reid's office told Minnesota Public Radio News that it's perfectly acceptable for the Senate to seat the winner of Minnesota's race after Minnesota certifies a victor. Reid's office also said the Senate would be unlikely to declare a vacancy while Minnesota sorts out who won. Without an official vacancy, Governor Tim Pawlenty could not appoint an interim Senator. After last week's series of long days of ballot challenge rulings, today's canvassing board meeting lasted just a little more than an hour. The main order of business was to formally close the ballot challenge phase of the recount. Members first rescinded two previous rulings on two ballots that didn't belong in the challenge pile. That action cost Democrat Al Franken one vote and brought Franken's running lead to 47 votes over Republican Senator Norm Coleman. Both campaigns told the board they found vote allocation mistakes in what was to be the final spreadsheet. The board is expected to reconvene early next week to reconcile errors identified by the campaigns. In addition to the housekeeping work, the board looked at 16 ruled-upon challenged ballots the Coleman campaign claims it lost because the board strayed from standards it used to consider other ballots. After quickly reviewing those ballots the board decided not to formally reconsider them. Following the meeting, Coleman attorney Fritz Knaak expressed disappointment. "Each one these ballots really does count," Knaak said. "Those consistency questions are real as I think they acknowledged and I would have like to have seen just as little more scrutiny but the answer is, it's not critical for our case in terms of what happened today or didn't happen but we are trying to make a point." The Franken campaign has been talking with growing confidence about it's contention it will win the recount. Amid that rhetoric have been repeated accusations that the Coleman side has been engaging in acts of desperation in hopes of turning around the numbers. "We remain up approximately 48 votes in the count," said Franken attorney Marc Elias. "The Coleman campaign's last, second effort Hail Mary pass fell incomplete which is good, because it's the right result for the people of Minnesota." Even after the recount is finally over and the results certified, most expect the loser will take Minnesota's 2008 Senate race to the next level -- a court challenge of election.